Don't even hide from this, because I know there are a legion of you meteors-destroy-the-earth fans out there. 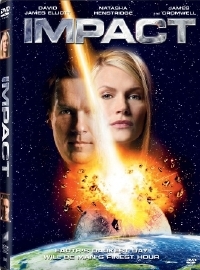 Sony Pictures Home Entertainment has announced that their 2-part destructo drama Impact, starring Benjamin Sadler, David James Elliot, Florentine Lahme, and James Cromwell, will street on September 1, 2009. During the largest meteor shower in 10,000 years, a rogue asteroid collides with the moon, causing a huge explosion and sending moon fragments catapulting to Earth. Soon, unusual phenomena begin to unnerve the entire planet: cell phones are disrupted, the normal pattern of the tides shift and heavy objects like cars become temporarily weightless â€“ all as the worldâ€™s leading scientists uncover unsettling evidence that the moonâ€™s orbit may have been permanently altered. Even more frightening, they discover that the new orbit has put the Earth directly in the moonâ€™s path and there are only 39 days remaining until it crashes into the planet. Now itâ€™s up to a small group of experts, cheered on by all nations of the world, to embark on a mission to the moon to try to prevent the deadly impact and save the planet from destruction. The film itself will be presented in 1.78:1 anamorphic widescreen, along with an English Dolby Digital 5.1 Surround track. Extras will include deleted scenes, and 2 featurettes ("Making of Impact", "Creating Zero Gravity").